Mr. Funk listens to Mr. Olah during rehearsals for The Violin Alone. The unlikely pairing of two child prodigies, Vilmos Olah, a Hungarian born violin virtuoso, and Eric Funk, a Montana born composer, has resulted in a stunning collaboration that pushes the boundary of classical music and our notion of “the possible”. Vili: Concerto for Violin Alone, Op 109 redefines what music can be. Written on two staves, the top line the solo part, and the bottom line the orchestra part, Olah has to perform both parts simultaneously. He is the soloist AND the orchestra. The Violin Alone is an extraordinary documentary film portrait of this revolutionary work of music, shared across continents, and lands that are rich with history and struggle. The music will melt in your ear, heart, and mind as the complete work is premiered in Budapest’s Nador Hall by Olah, with stunning high definition photography and pristine surround sound audio. How close have you ever been to a violin? This film will take you closer. You will hear the hair of the bow coursing the strings, see the rosin fly, you will hear him breathe, and the violin breathe. A story of soaring hopes and constant struggle is shared with honesty and willingness to let the subjects speak for themselves. The film will follow Eric and Vilmos as they work out every detail; fingerings, string assignments and bowings. It offers a compelling, unblinking portrait of an unforgettable work of music, an intimate look inside the minds of musical genius, and enters a corner of the world many of us never experience. Written especially for the unique virtuosity of Olah, Vili: Concerto for Violin Alone is groundbreaking. He faces a seemingly impossible task: navigating idiomatic techniques that composer Eric Funk considered theoretically possible but most probably impossible. Olah must emulate flutes, oboes, clarinet, and timpani, must move his bow towards the bridge in an exact unique position to capture the timbre, the crisp brass punch, of a trumpet fanfare. In the third movement, his right hand is bowing the solo part while his left hand ring finger is playing pizzicato to form the pulsing rhythmic accompaniment. Composing just another concerto for violin and orchestra is not, in and of itself, particularly earth shattering. Creating a whole new vision of what the 21st century classical concerto might become, this new composition forecasts the emergence of a “new music genome”. The potential impacts are comparable in spirit to the once-deemed unplayable violin masterworks of late 18th c. composer Niccolo Paganini. Today, Paganini’s compositions are standard repertoire for professional players world-wide. Currently, Vilmos Olah is most probably the only violinist in the world who can play this brave, new solo violin concerto. Composer Eric Funk first heard Olah play in a recital in Bozeman, Montana. There he discovered Olah’s virtuosity, timbrel range and idiomatic technique, so huge that while he was listening he started hearing an orchestra coming out of the solo violin. “This man is an orchestra all by himself” says Funk. 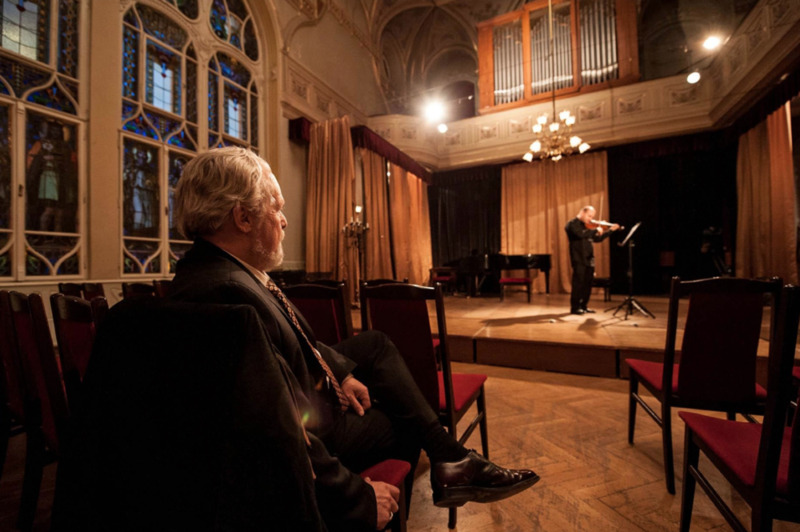 One recital became the inspiration for Eric to compose a concerto for the violin alone, specifically for Vili. Funk’s mentors, Tomas Svoboda, Krzysztof Penderecki, and Sandor Veress, the famed composers, hailed from the Czech Republic, Poland, and Hungary, respectively. Each composer insisted while teaching Funk that his music should be driven by a metaphor. When creating this work for Olah, Eric Funk looked to the world of Eastern European folk music, rife with feeling and full of heart, and the struggle that has often been central in the lives of people from the former Austro-Hungarian Empire, and today. He has experienced that, even when facing endless occupations, wars, and suffering, the Hungarian people have continually risen to prevail while revealing a richness of deep feeling, a wealth of the soul and indelible spirit. It is this unquenchable force that Funk meant to capture in a work that requires skill, courage, perseverance, and phenomenal technical skill, creating a vehicle where one man alone can stand as a collective. Experience this triumph of spirit made manifest in the violinist, with his violin, alone.